After a few busy weeks I decided to take the day off and rest on Friday. Much as I felt it a day wasted it also felt like the right thing to do. So come Saturday I was semi-refreshed and up for a ride on the paths of the South Downs once again. The Old Toll Bridge over the Adur – Shoreham – at high tide. Starting at sea-level I took the path up by the side of Lancing College, around the edge of Lancing Ring and continued up to the intersection with the South Downs Way. From there it was straight up to Chanctonbury Ring. Normally I would have stopped at the top of the long gradual climb and admired the view, but not today. I had the bit between my teeth (may be it was the new inhaler I had just got, saving me from panting like an old steam train). 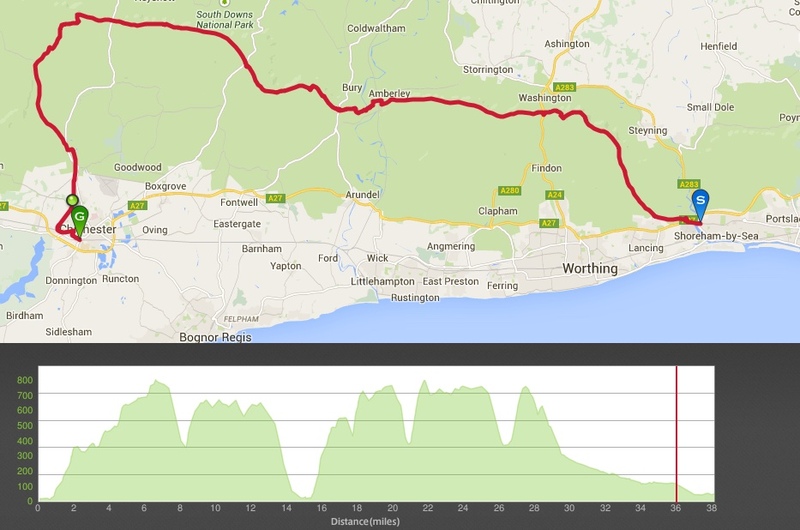 On west I travelled, down the steep chalky descent to the A24 crossing, before climbing up again towards Storrington. The ground was pretty hard and my summer tyres felt fine. From there I followed the SDW back down to near sea-level crossing the River Arun. Back up again and from there it was a series of climbs and descents until just past Cocking. Follow the white chalk path! Then I took a left turn, thinking I better head down to Chichester for a train back. Initially I picked the wrong path and found myself following a forest trail down a very steep section with the only way out being back up the other side (I was starting to feel a bit tired at this point). Then fortune smiled and I took another left turn and found a belting single track section at the edge of West Dene Woods – bliss! Finally, breathless, I hit a quiet a country lane and then a clear road (and strong headwind) to Centurion Way cycle path into Chi. 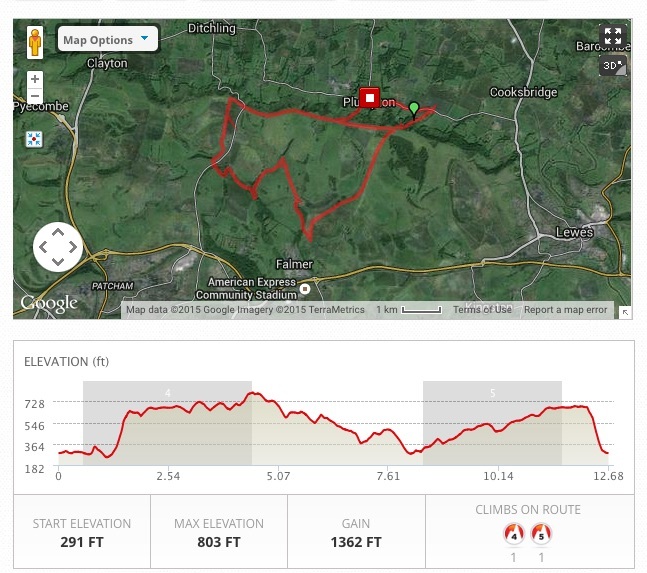 All told it was just over 38 miles (c 31 off-road and 7 on tarmac) and an ascent of over 1000m (equal to climbing Snowdon). I was pretty pleased just two months after being allowed to ride after my hernia op. However it was rather testing of my politeness and made me think about MTB and walkers étiquette? I normally give walkers and horse riders space and slow down (or stop for some horses), and say hello – but by the end of Saturday’s ride I was wondering if others care. 3) Group of five walking towards me – 100m plus visibilty – across almost whole width of path – only left a puddle for me to go through – I slowed but..
6) Group of six walking towards me – 100m plus visibilty – across the whole path – only slowly moved as I almost came to a standstill. Time for a chill pill and Sunday’s wind down ride. 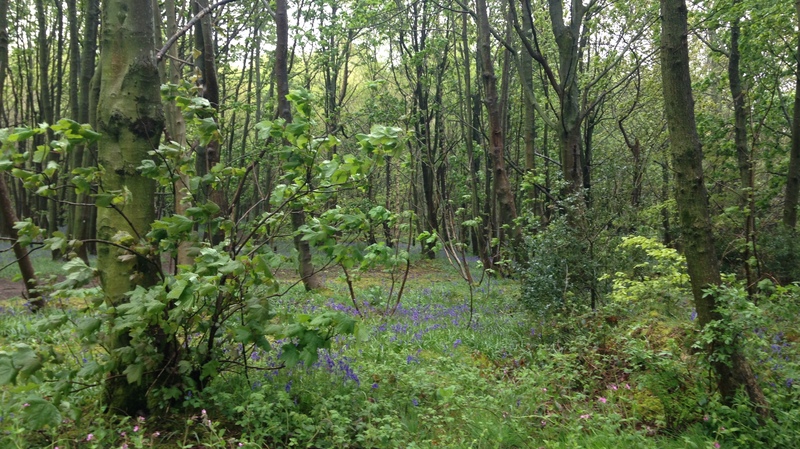 I then found some Bluebells, and twisty single track with trees spaced almost as closely as my handlebars, in Stanmer Park. 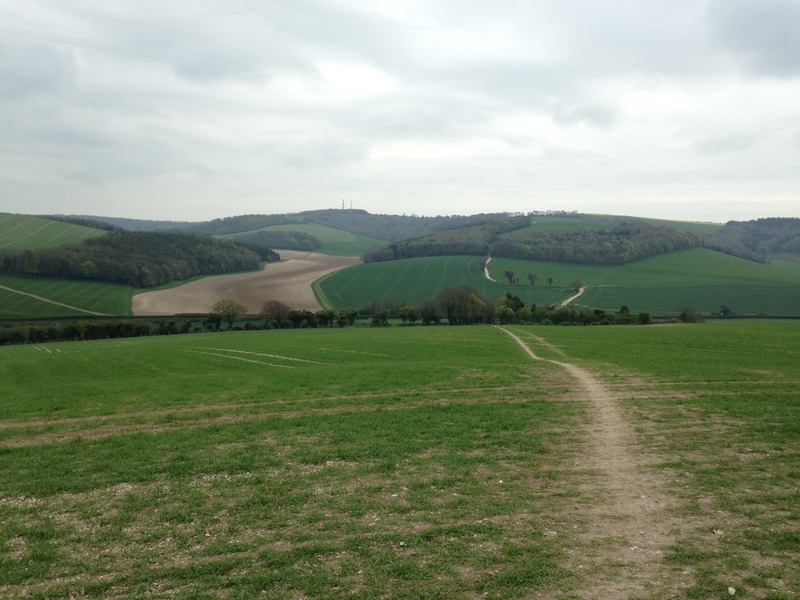 This entry was posted in Cycling, MTB, South Downs Way and tagged biking, MTB, MTB Sussex. Bookmark the permalink.